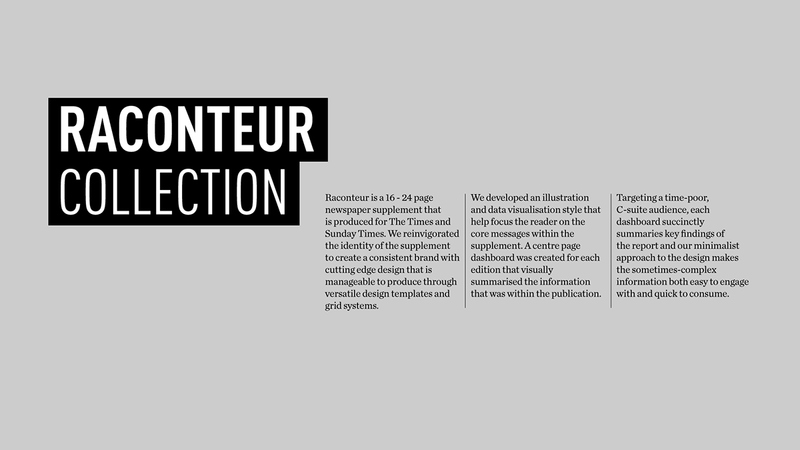 Raconteur is a 16 - 24 page newspaper supplement that is produced for The Times and Sunday Times. We reinvigorated the identity of the supplement to create a consistent brand with cutting edge design that is manageable to produce through versatile design templates and grid systems. We developed an illustration and data visualisation style that help focus the reader on the core messages within the supplement. A centre page dashboard was created for each edition that visually summarised the information that was within the publication. Targeting a time-poor, C-suite audience, each dashboard succinctly summaries key findings of the report and our minimalist approach to the design makes the sometimes-complex information both easy to engage with and quick to consume.